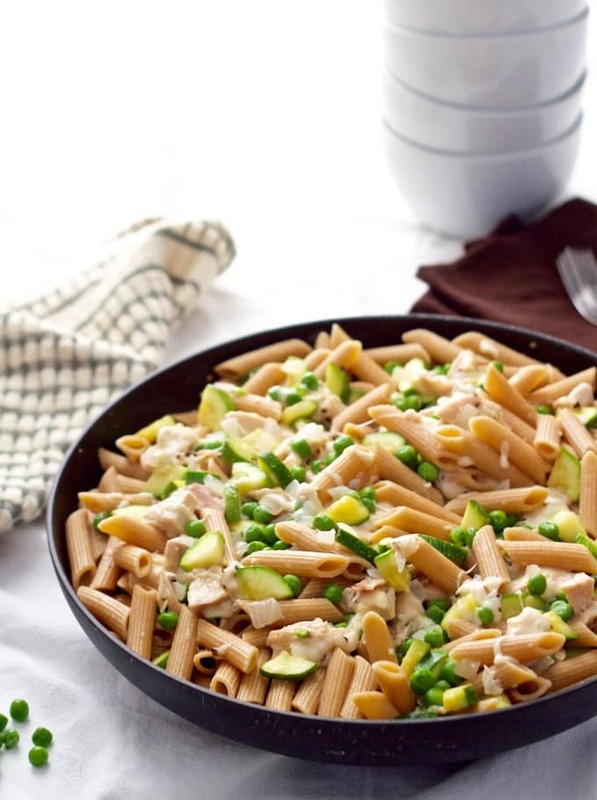 A fresh, light chicken pasta dinner with zucchini, peas and two cheeses. Ready in just 20 minutes and very budget-friendly! And now it’s winding down and I can’t believe we are at the end of the year. I’m also ready to slow it way back down on the food front. 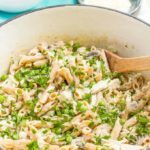 In the plans for that first week of January is one of my go-to, easy, fast, budget-friendly chicken pasta dinners. Serious goodness going on here, you guys. 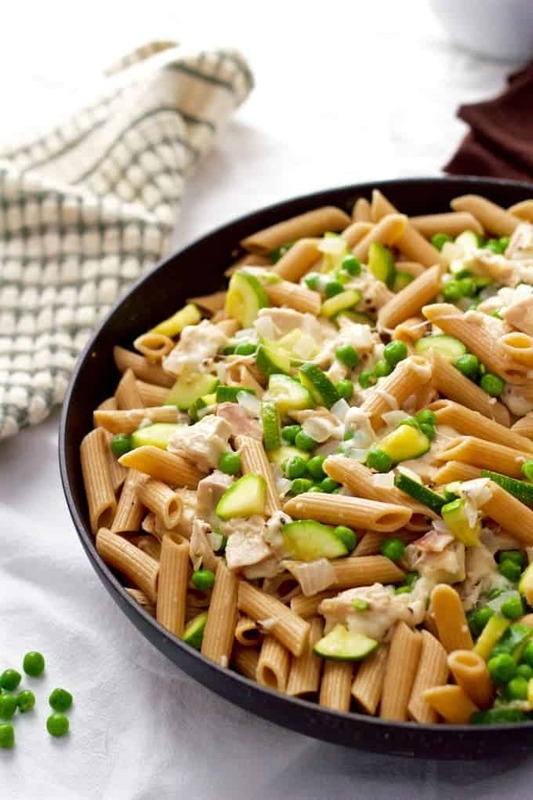 It’s got zucchini and peas, which just pair so perfectly in my book. (And I can find them easily all year long. I’m never without a bag of frozen peas in the freezer.) 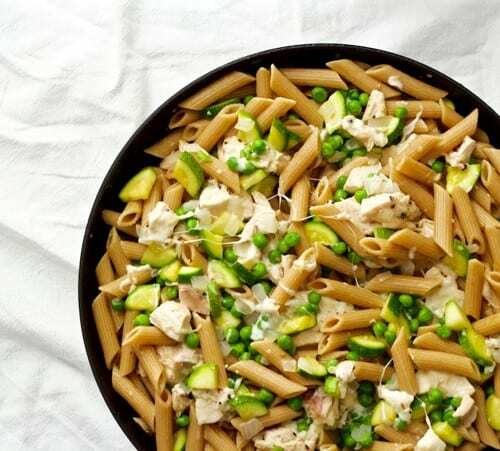 Beyond those veggies, we’ve got whole wheat pasta, rotisserie chicken (from the store, or leftover if you’ve got some extra on hand) and two cheeses. It’s always a good idea to double up when it comes to things like cheese. 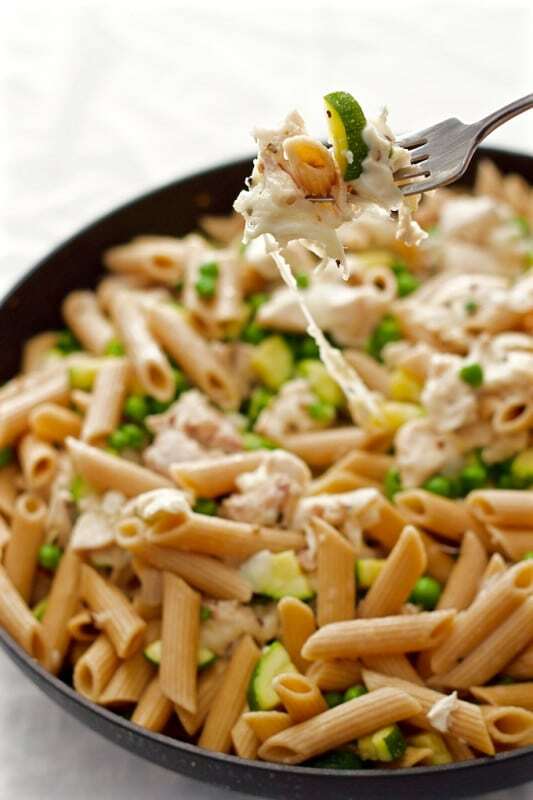 It’s light, bright and fresh with the lovely stretchy cheeses that work their way around the pan to grab hold of the veggies and chicken and pasta and bring everything together. You can’t give me a fork big enough. And everything else for this dish is ready by the time the pasta cooks, so it’s super fast. 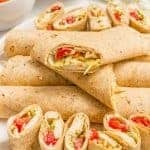 I make the whole batch, even if it’s just the two of us for a late dinner, and we all enjoy the leftovers for lunch or dinner later in the week. Here’s to a happy, healthy, family-filled New Year! Enjoy! 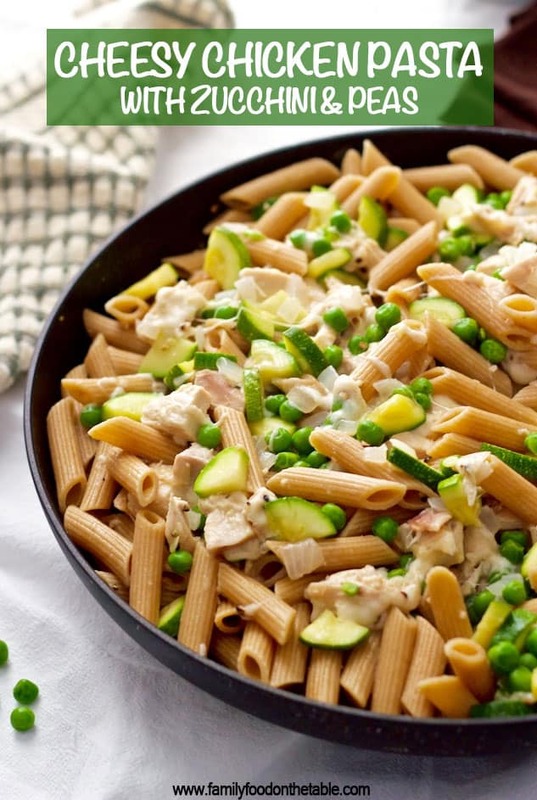 A fresh, light 20-minute chicken pasta dinner with zucchini, peas and two cheeses! Meanwhile, heat 2 teaspoons of olive oil in a large saute pan over medium heat. Add the onion and zucchini and saute for 3-4 minutes, until slightly tender. Season with 1/2 teaspoon of salt and 1/2 teaspoon of black pepper. Add the chopped cooked chicken and the frozen peas and stir to heat through, 1-2 minutes. When pasta is finished cooking, reserve 1 cup of the cooking liquid and drain the pasta. Add the pasta to the skillet along with 1/2 cup of the reserved cooking liquid. Add cheeses and stir to combine. Stir in extra splashes of the reserved cooking liquid, if needed, to help everything combine. Add remaining 1/2 teaspoon salt and 1/4 teaspoon pepper, taste and adjust seasoning. Drizzle with extra tablespoon of olive oil, if desired. Serve with extra Parmesan cheese for passing. 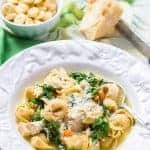 If your skillet isn’t big enough to hold everything (and be able to stir it), add the pasta and other ingredients back to the big pot you cooked the pasta in. Yes to cheese and pasta!! Two of my favorite things to combine and eat all up. Thanks for making a healthy recipe and adding some veggies in there so I can eat this all the time. Hee, hee. Glad you had a wonderful time with the Hubby in Aruba and a wonderful Christmas with the whole family. Here’s to a fantastic 2016 and Happy New Year!! This is one skillet of yumminess! Thanks Julie! 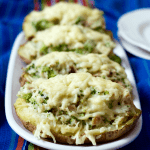 It really is a great combo and I love that it’s an all-in-one dinner! 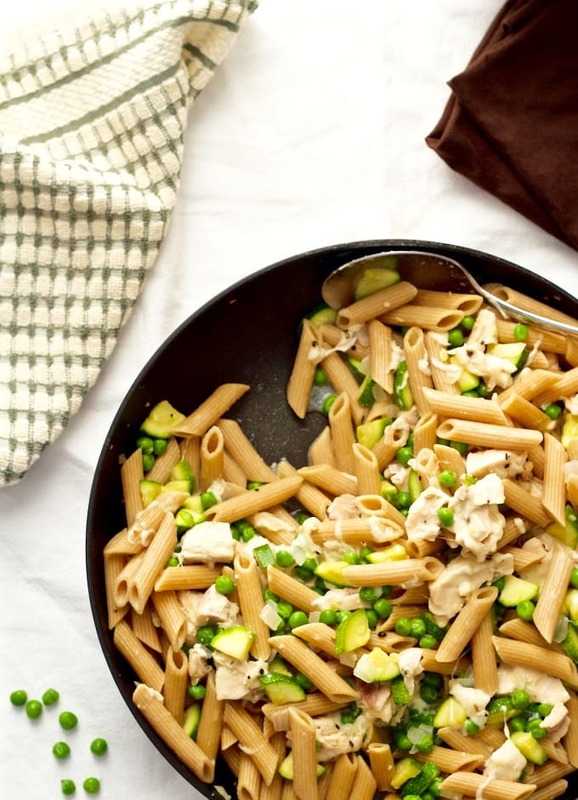 Wow this one dish dinner looks terrific and so pretty with all of the green veggies! Thanks for sharing this, found you at Throwback Thursday! This looks great and so easy, what a great weeknight-meal 🙂 And Aruba sounds amazing, is it as pretty in real life as it looks on photos? Thanks Petra! 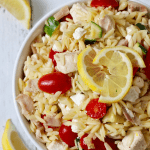 It’s such a delicious, easy, fast weeknight dinner! And yes – Aruba is every bit as beautiful in real life! The weather is amazing, the water is unforgettable and the beaches are just so lovely. Highly recommend! Hi! Wanted to try this but am not a fan of onions, particularly the texture. I’m not a good cook so any suggestions on how to use onion for flavor and not actually have in the dish? What about onion powder? Hi! 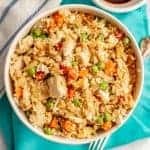 You could try removing the onions after you saute them (before you add the chicken and peas to the pan) so that you have some of that flavor without the actual onions in the final dish. Hope that helps – and hope you let me know what you think!